Purchase today for $20.00 + $3.23 S/H. All proceeds go to Peace House Africa! Sign up to receive my complimentary chapter from the popular book, Blueprint for Success! PURPOSE: Invite you to help transform an AIDS orphan’s life through education. Lesson #1: Know Where You are Going — How can I overcome the “I don’t know what I want” syndrome? payday loans canada on Lesson #1: Know Where You are Going — How can I overcome the “I don’t know what I want” syndrome? JC on Lesson #1: Know Where You are Going — How can I overcome the “I don’t know what I want” syndrome? What is Your Calling? is a short supplemental series to “Lesson #1, Know Where You are Going and Why.” I will be writing it over the next couple of weeks and then hope to put it into a pdf format for downloading. We all have moments in life when we know, at our core, that something has permanently changed for us and that our personal truth is being surfaced. I know that this is happening when my body begins to shake and I begin to cry. This is a story of one of those times. In December 2007, I was standing in a Hindu temple in Bangalore, India. The CEO of Microsoft India had arranged a personal tour for me which was led by one of the priests. The temple was an incredible structure, larger than many of the cathedrals I have seen in Europe. And, it was alive with activity. Unlike a cathedral, there were no pews to sit on. People were sitting on the floor or walking around. A show of some sort took place on a stage. People were singing and dancing. The colors and scents of the place were vibrant. My description does not do it justice, but that moment created a vivid picture for me to always remember. After the priest arrived for the tour, he brought me to a room with some of the largest industrial cooking equipment I had ever seen. I worked in a university cafeteria for awhile and thought I had seen big equipment, but I had seen nothing quite like this. I asked him what the equipment was for and he explained that his temple was responsible for the One Million Meals program, his temple produced one million school lunches a day for children in poverty. Given that this was the one meal per day that most of these children would receive, the parents ensured that their children went to school. In addition to being fed, the children were also educated. And that was the priests’ true objective. Convinced that education was the tool for transforming lives, they had strategically invested their time, talent, and treasure into delivering school lunches. I looked at him with my jaw hanging open. For a moment, I struggled to find the right words to express my awe of what they were doing – One Million Meals, and for an incredible purpose! Inadequately I expressed this awe by saying, You must be so proud of the work that you do. Puzzled, he replied, Why would I be proud? It is what God called me to do. Tears formed in my eyes and my body began to tremble, and an important truth was revealed and I was permanently changed. But, at that time, I didn’t understand it. On one level, I knew something profound had happened, but I couldn’t figure out what it was. It would take me nearly two more years to decipher the experience. Several things happened during that time. In some respects I can say that I experienced the greatest professional success of my career. My family was healthy and happy. Life seemed like it should be perfect. But it wasn’t. I was remarkably unhappy and dissatisfied. A lot of my unhappiness stemmed from a lack of recognition for my work accomplishments. Although my team was recognized externally by professional associations, internally at my company, my work and team were barely acknowledged. 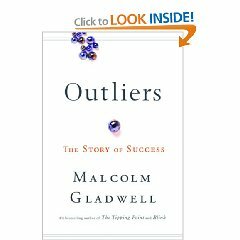 I’m embarrassed to say it now, but all I really wanted was for someone at a senior level to tell me in a meaningful way that I had personally made a difference at my company. For me, the symbol of that was a promotion. And when it didn’t come, year after year, I became frustrated, hurt, and angry. I became entirely wrapped up in it. The less likely it seemed, the angrier I became, and the more I wanted it. It was a vicious cycle. Yet during this period of dissatisfaction, the priest’s words haunted me. They got under my skin in a way I could not understand. At random times they would pop into my head, Why would I be proud? It is what God called me to do. I would ask myself what it meant, but I was blocked. And then, amazingly, one day in the early summer of 2009, I got it. It happened when I was speaking to a colleague, and for what felt like the umpteenth time, my work and team were not acknowledged. I thought, After everything I have contributed, if even he can’t acknowledge it, what’s the point? Why am I doing this? And I accepted the potentially brutal truth, What if I had gone as far as I could go professionally? What if the potential I felt within myself didn’t really exist? What if the best I could ever be was a director in a large multi-national? If this is as good as it gets, I asked myself, is it good enough? And the answer that rumbled from the bottom of my soul and shot through my heart and then purged itself from my lips was NO! Now, surprisingly to some, this did not make me decide to drop everything and quit my job to become a stay at home mom. (I had come to terms long ago that for me to be the best mother I could be, I also needed to work outside the home.) Instead, it caused me to ask myself if there was anything else that I felt as strongly about. As a mother, I had no expectations of glory. I didn’t even expect my kids to tell me what a wonderful mother I was. I just wanted to be the best mother for them that I could be, to raise them in a way that they could realize their full potential in the world. And when I asked myself if there was anything that I felt as strongly about, it occurred to me, yes there was one thing — the power of education to transform lives. And then I understood why the priest’s words had haunted me. Notice, I say words, not acts. It is true that his temple’s purpose to ensure the education of impoverished children is meaningful to me, but the concept of not being proud, which for me also meant that he had no need for recognition of his work, that is what moved my soul. Why would I be proud? It is what God called me to do. At the soul level, I understood that I wasn’t living my calling. If I had been, I wouldn’t have been wrapped up in the need or recognition. It would have been meaningless to me. I was humbled because when confronted by someone who was living his calling, I understood at the most profound level, that I was not. And that knowledge, although subconscious, shook me to my core. Since June 2009, many things have shifted for me. And the insights I have gained and actions I have taken will be the subject of the rest of my series on Callings. For the moment, I leave you with the questions that brought me my greatest insights: If this is as good as it gets, is it good enough? If no, What would make it good enough? Invite you to help transform an AIDS orphan’s life through education. I am raising a minimum of $3,000 to support the education of students at Peace House Secondary School in Arusha, Tanzania, www.peacehouseafrica.com. In February I will travel to Arusha, to volunteer at Peace House which was established for AIDS orphans and other vulnerable children, and I would welcome your help. As many of you know, I had my first book published last year, Blueprint for Success. To aid my fundraising efforts, I will sell 150 personally inscribed books for $20 each (+shipping) with all proceeds going to Peace House Africa. 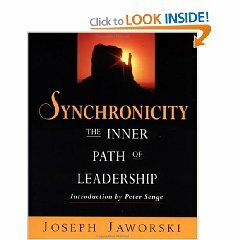 You can purchase the books directly through my blogsite www.theyellowarrow.com starting Monday, January 25, 2010. In the dropdown box for “Special Instructions to Merchant”, indicate who the book is for and I will personalize the inscription. Thank you for your kind consideration in supporting this effort. If you are not interested in purchasing a book but would still like to make a contribution, even if it is $1, please let me know and I can send you a link from my PayPal account. Thank you for any support you can offer. 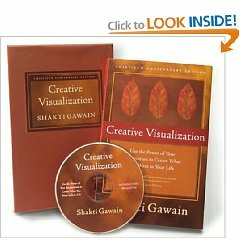 For several years I have taught a workshop called Visioning for Results. I believe that it is possible to get more of what you want in life if you understand and apply three things: The Path of Least Resistance; Creative Orientation; and Creative Tension. This blog focuses on understanding the first. The path of least resistance describes the physical or metaphorical pathway that provides the least resistance to forward motion by a given object or entity, among a set of alternative paths. More simply stated energy goes where it is easiest for it to go. I use an exercise to demonstrate this principle, which I will describe later in the blog. First, I have one request…don’t think of a red car. What is the first thing that happened? Of course, you thought of a red car. But do you know why you thought of a red car? Because your brain does not understand a negative in the absence of the positive. Or more clearly, as soon as you read, DON’T think of a red car, your brain has to think of the red car in order to understand what it shouldn’t think of. It has to understand the positive statement first to understand the negative command. This is a fact about how the brain works. Thus, if I really don’t want you to think of a red car, it would be better to say, think of a blue car or think of a pink elephant. The red car would never enter the equation and you would never think of it. Step 1: The brain sees the positive, spill the milk. Step 2: The brain adds the negative, don’t. Step 1 + Step 2 = unspilled milk or milk still in the cup, hurrah! Now, to make it simple, let’s assume that each step requires brain energy of 1 unit. Step 1 (1 unit of Brain energy) + Step 2 (1 unit of Brain energy) = 2 units of energy expended to keep the milk in the cup. Okay, so the simple statement of “Don’t spill the milk” requires 2 units of energy. Step 1: The brain sees the positive, hold onto your milk. Step 1 + (no further instruction) = unspilled milk or milk still in the cup, hurrah! Requiring only 1 unit of brain energy, Equation B requires less energy than Equation A which requires 2. Tah Dah! This is how you get what you want while using less energy. Sounds too simple? Feeling a little skeptical? Pretend that it is true and apply it to how you live your life. In the current economy, how many of us haven’t thought, “I don’t want to lose my job.” And, we put our energy into “Don’t lose my job!” Think first about the instruction you have just given your brain. First, the brain has to understand “lose my job.” Hmmm, probably not the best place to focus the brain’s energy in the first place, then it has to use the second unit of energy on DON’T! The better instruction is “Keep my job.” It is more direct, enables the brain to really focus on what you truly want, and uses less energy in the process. 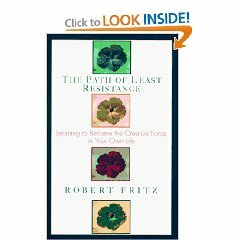 To learn more read, Robert Fritz’s The Path of Least Resistance. Fritz applies this law to creativity. The Path of Least Resistance is a foundational tool in getting more of what you want in life. Apply this principle see how it works for you. There are only two reasons we don’t get what we want in life. We don’t know what we want and/or we don’t think we can have it. I firmly believe it is as simple as that. I’ve heard many people belabor the second part and have listened patiently as they’ve woven the intricate web that proves this point. And, when they peel away all of the layers of stories they have told themselves about why circumstances are getting in their way, it still is as simple as they don’t think they can have it. And, it can be a powerful limiting belief that prevents them from even dreaming about what they truly want. After all, what’s the point of dreaming if you already know you can’t have it? However, when you get right down to it, what’s the harm of wanting something just for the sheer delight of wanting it? And, knowing what we want can be a particularly daunting task. Some of us have followed the desires of those around us for so long that we have begun to confuse their desires with our own. Others of us have spent so much time listening to our inner voice of reason that we have totally abandoned our inner voice of desire. But let’s say you have finally given yourself permission to want something, what do you choose? How do you discover it? As I observed in my Camino experience, I have had moments of clarity in which knowing what I wanted became so powerful that it became a guiding force in my life. And, like everyone, I’ve also had those other moments when I didn’t have a clue. But, unlike many, when I am stuck, I have some tools that I go to for help and that I will share with you. First, ask yourself, “What do I want?” You’d be surprised how quickly you might get an answer. When a question is posed, a synapse opens in the brain and it does not close until the question is answered. Sometimes just opening the synapse enables the answer to surface. If you don’t get an answer right away, try focusing your attention on something else. The answer may come when you least expect it. You know how things pop into your head when you are in the shower or when you just wake up. Fill in the blanks as quickly as possible. If you had five other lives, what would you really enjoy being? Astronaut? Scuba diver, brain surgeon, architect, pilot? The point of these lives is for you to have a good time in them. The point of both exercises is to bring you back to what you truly love. When I was a small child I wanted to be a ballerina, an actress, and the first female president of the United States (maybe I could still achieve the last one J ). When I reflect on these roles I see commonality in some of my work today. I still love to “dance” for a crowd. Put me on center stage, and this is where I normally shine. Public speaking is my favorite passion. I love to share my ideas and others ideas with an audience. And, I have to admit that I enjoy leading. I like to point to a destination and inspire people to move in that direction with me. I did not end up in any of the three roles, but the essence of what I loved about each one of them is a part of what I love in my career today. 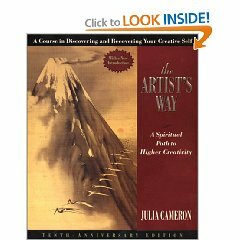 So, quickly answer Julia Cameron’s questions and then take some time to reflect and ask yourself Why did I want to be a ___________? What is the essence of that role that truly appealed to me? What did I think I would get out of it? What part appealed to my soul? When you have answered those questions, come back, I’ll be here. This blogsite is dedicated to more deeply understanding the 15 Lessons of the Camino as shared in my chapter, Getting to the Destination, from Blueprint for Success. Each month, I highlight one lesson, explore it in greater depth, and provide tips and exercises for making it work for you. If you work the lessons, I think you can make some real changes. I’ll be interested in hearing from you.